Yachad and UJS to host talk by boycotter Peter Beinart at UJIA. 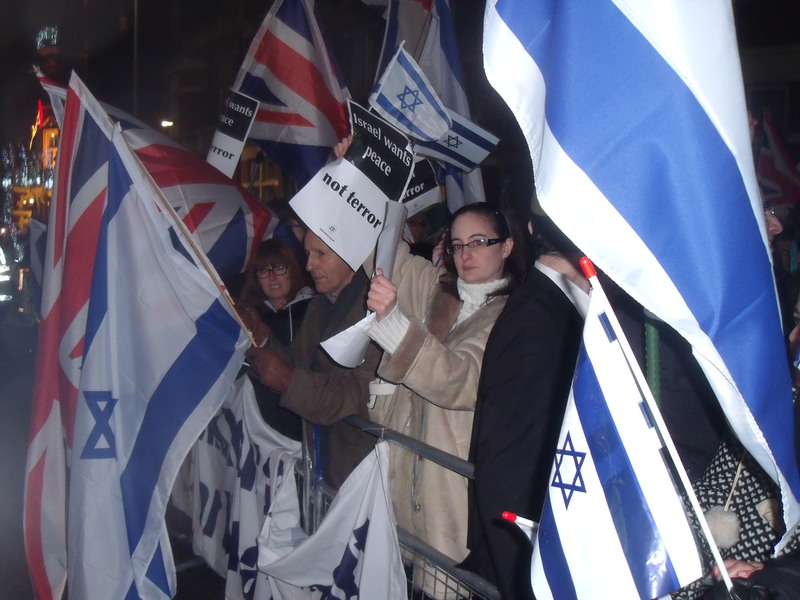 Yachad calls itself “The pro-Israel pro-peace voice of British Jews”. 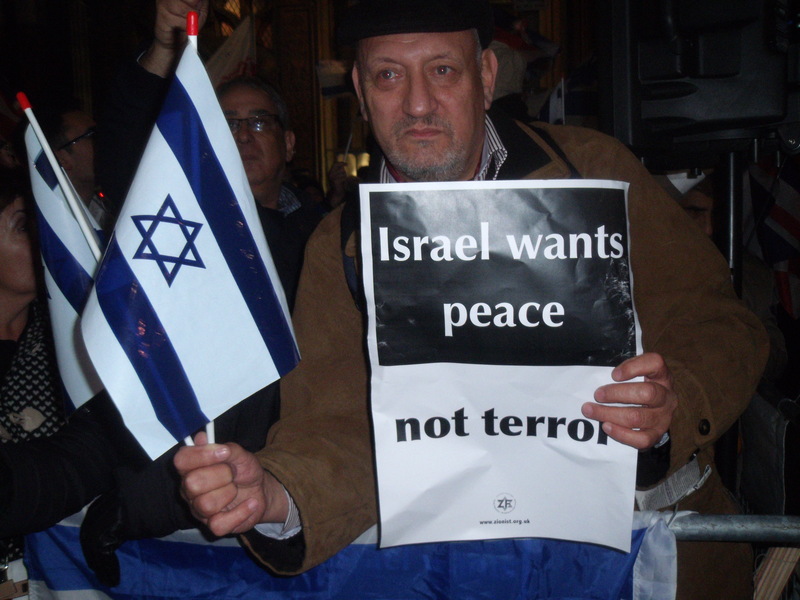 It’s as if no other pro-Israel British Jew can possibly be “pro-peace”. Just those Jews who support Yachad, you understand. At the United Nations in New York today at what is euphemistically called Observance of the International Day of Solidarity with the Palestinian People, “Palestine” is due to be recognised as a non-member observer state. However, today’s rhetoric has had nothing to do with Palestinian statehood, but has been tantamount to incitement to murder Jews and Israelis and to boycott Israel out of existence. One Arab delegate accused Israelis of burning the Koran, and Roger Waters spoke for 25 minutes. Waters accused Israel, inter alia, of apartheid and prioritising Jewish people above its other citizens. He demanded a boycott of Israel. Delegate after delegate called for a two-state solution and for UNGA Resolution 194 to be implemented. 194 calls for a return of Palestinian refugees to Israel. As the UN classes ALL Palestinian descendants as refugees this would soon lead to the demographic destruction of Israel as the world’s only Jewish state. What UN delegates are, in effect, calling for is a two-state solution as long as both states are Palestinian. Waters, ludicrously, claimed that Hamas has agreed to future peace with Israel as long as a Palestinian state is agreed along the 1967 ceasefire lines. He claimed that New Yorkers, cut off from the outside world, don’t know this. Hamas who, in their Charter, call for the murder of all Jews are hardly going to agree to any Jewish state along any lines. It is Waters who is cut off. But, now, with this growing febrile atmosphere against Israel where Israelis are demonised and demands made that they be boycotted Peter Beinart has been invited by Yachad and the Union of Jewish Students to address a Jewish audience at the offices of the United Joint Israel Appeal (UJIA). UJIA, a charity, is supposed to have the interests of Israel and all Israelis at heart. As you can read Beinart calls for “a boycott of West Bank Settlement produce”. So because Beinart disagrees with a group of people, in this case Israeli settlers, he wants their businesses and livelihoods immediately destroyed and their ability to feed their families and young children immediately curtailed. All they have worked for should be destroyed overnight on the say so of someone living thousands of miles away? Now Weisfeld, Yachad and the Union of Jewish Students have invited Beinart to make the case, via Skype, for just such a targeted boycott of those Israeli families living on the West Bank. By all means disagree with their living their and make the case that they shouldn’t be. Try to achieve a gradual change in Israeli government policy, like when Ariel Sharon finally decided to order Israeli settlers to be removed from Gaza. But for Beinart and others to encourage the wrecking of people’s livelihoods overnight is crossing a red line, let alone a green one. We hear it enough at the hundreds of anti-Israel events that take place annually. Why any Israeli can be murdered by Palestinian terrorists, as explained by The Guardian’s Chris McGreal. Meet Abu Jindal and Abu Nizar. Up until fairly recent times they might have been fixing cars for Israelis. Nizar’s father even “had good things to say about the Israelis he knew”. So what makes it so easy for Nizar and Jindal to murder innocent Israeli men, women and children? Judging from Chris McGreal’s piece, Gaza’s cycle of aggression shapes new generations more militant than the last published in last Friday’s Guardian, it’s all Israel’s fault with Nizar and Jindal having little, if any, responsibility for their terrorist activities. McGreal describes their, apparently, violent childhoods that led to Nizar and Jindal firing rockets from Gaza and, possibly, murdering the three above-mentioned “civilians” Ahron Smadga, Yitzchak Amselam and 25 year-old Mira Scharf in Kiryat Malachi. Scharf was pregnant. Sickeningly, McGreal allows Nizar and Jindal the space in his piece to excuse themselves as mere victims, the implication being that the real criminals were Smadga, Amselam, Scharf and Scharf’s unborn child who weren’t “civilians”. Incidentally, Scharf had recently returned to Israel to give birth and to attend the memorial service of her friends the Holtzbergs who were murdered in the 2008 Mumbai massacre. They all died on the same day of the Hebrew calendar four years apart. Nizar claims his schoolfriends “were killed by an Apache helicopter”. Neither Nizar’s school friends shot from the sky, nor McGreal’s school children shot at their school desks are named. Conveniently, no evidence is offered. The unsubstantiated accusations are just thrown in. In case the reader doesn’t quite understand that these are attempted justifications for Jindal and Nizar slaughtering innocent Israelis McGreal decides to import two old Guardian pieces of his. These pieces give the views of two child psychologists in an attempt to help solidify the images of Jindal and Nizar as helpless victims. In the piece from 2004 Usama Freona claimed “The levels of violence children are exposed to is horrific…Most of them were crying and shaking when they were speaking about their experiences”. In the 2009 piece Dr Abdel Aziz Mousa Thabet claimed that due to the traumatising effect of violence on children “they become fighters”. That these two vile terrorists might be committed to the destruction of Israel and murder of its Jewish inhabitants on purely ideological grounds isn’t considered. Incredibly, McGreal’s piece on Dr Thabet still describes 12 year-old Mohammed al-Dura as being shot dead by Israeli gunfire despite it having since been proved that al-Dura was more likely to have died from Palestinian gunfire. McGreal is obviously keen in prolonging this blood libel. McGreal admits that Palestinian children are sometimes taught in their schools and mosques to despise Jews but he sees that, mainly, as an excuse used by Israelis to absolve themselves of blame for why each generation of Palestinians seems more militant and violent. Abu Nizar concludes “The end of Israel is getting closer”. Next week The Guardian will be running a full-page piece on McGreal’s interview with two Al Qaida “fighters”. The “fighters” explain why they are at ease with their fellow Islamists slaughtering 52 British citizens in the London bus and tube bombings of 2005 and why, for them, there is no such thing as a British civilian. Or, maybe, The Guardian won’t run it. Maybe for The Guardian only the slaughter of innocent Israeli men, women and children (and unborn babies) can be explained with such apparent ease: No Israeli is a civilian and, so, murders of them can be justified. I wondered whether to write about this as it will come as a surprise to very few. Manuel Hassassian, the Palestinian ambassador* to Britain, delivered, while speaking at Caabu’s Emergency Meeting on the Crisis in the Middle East held in Parliament on Wednesday evening moments after the ceasefire between Israel and Hamas, what seemed to be the unofficial line of the Palestinian Authority on the future of Israel and the Palestinians. Hassassian claimed it was his personal view but if this is the approach taken by other Palestinian ambassadors then there is no hope for peace. “I would like to see a two state solution, but the Oslo peace treaty is dead. If you look at the ground, what is happening today, there is nothing left to salvage of a two state solution. As a representative of the Palestinian authority I must tell you that I am for a two state solution. But I want to remove my authority cap and put it aside and become the kind of person who is observing what is left of the two state solution. Ladies and gentleman, there is no two state solution left. We have to look to other, what I call, ingenious ideas and look outside the box and the only thing that comes to my mind is very simple; there is only one solution, which is a one state solution. Of course liberals from Israel’s centrists, and extremists, are going to panic and be terrified when you say ‘One state solution'”. Hassassian also spoke of Israel not being interested in peace and having a “war agenda” and time “being not on the side of Israel”. During the Q&A I asked the Ambassador how long he thought, in the event of a peace agreement between Israel and the Palestinian Authority, it might take for Hamas to murder or imprison Fatah/PLO officials in the West Bank like they did in Gaza? These are fine words, but how can Israel “relinquish the occupied territories” and still be sure that Palestinian terrorists won’t bomb Tel Aviv or Ben Gurion airport, for example? Can Israel afford to take such a risk after seeing what is unfolding in Syria with a future takeover by Islamists opposed to Israel’s existence? And just because Egypt and President Morsi are being reasonable now doesn’t mean they will always be, does it? But far more than that, Israelis are never going to vote their own country out of existence after all they have worked for and sacrificed. Demanding a one state solution is only a recipe for further Israeli and Palestinian blood to be spilled. At the end even a CAABU member came over to tell me he thought the Palestinian Ambassador’s rhetoric wasn’t progressing the Palestinian cause much. Hassassian has been an ambassador here for seven years. Is such a long term normal? Or do ambassadorial changes go the same way as Palestinian elections; few and far between, if at all? I have nothing against Hassassian. However, his call for a one state solution is deeply problematic considering that the international formula, supposedly accepted by the Palestinian Authority, is two states for two people. As Herzl said of a future Jewish state, which seemed a distinct impossibility anywhere at the time, “If you will it, it is no dream”. If Hassassian and his fellow diplomats can’t even bring themselves to will a separate Palestinian state then they should step aside and let others take the opportunity of working towards that desired national goal. * I am informed that Manuel Hassassian is technically not an “Ambassador” seeing that there is no formally recognised Palestinian state. He is, therefore, referred to as Palestinian General Delegate in London. Protests fail to disrupt Batsheva Ensemble’s Deca Dance show at Sadler’s Wells. The Batsheva Ensemble, the youth wing of the main Batsheva dance company, received a standing ovation at Sadler’s Wells in London last night after an outstanding display of music and dance. Batsheva’s Deca Dance show, a collage of impressive pieces, consists of 16 dancers aged between 18 and 24 years-old. The 16 are mainly Israeli although there are two dancers from Spain and one from Russia, America and Japan, respectively. As you enter the auditorium there’s a single dancer already on stage welcoming you in with some humorous improvisation. 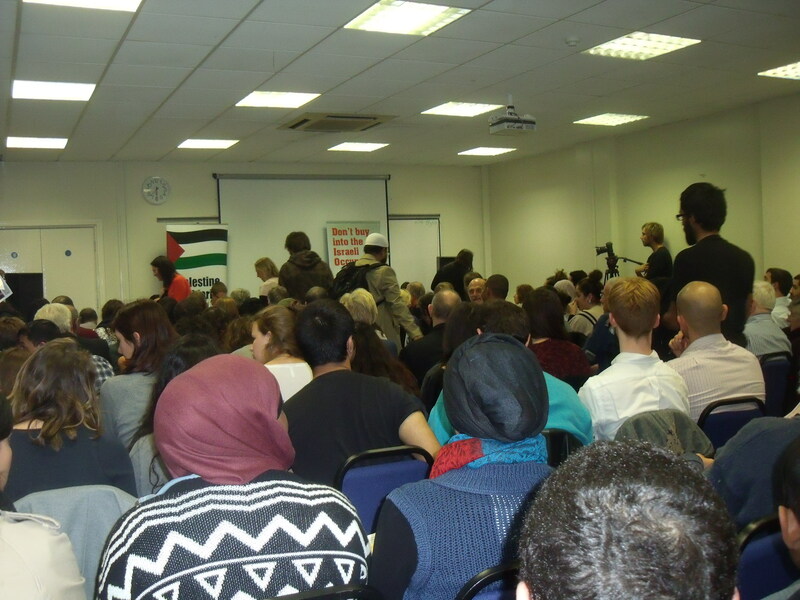 Ten minutes in to the show shouts of “Free Free Palestine” were quickly drowned out by spontaneous audience applause. Security was dotted unobtrusively around the theatre to deter anything more prolonged. Two more similar attempts at disruption took place during the show but they were met with a similar audience response. The second half was dominated by the female and male dancers seemingly dressed as Chabad Lubavitch Jews in dark hats, white shirts and dark trousers. They then interacted brilliantly with the audience, and the audience with them, before bringing the curtain down with the most powerful rendition of all thirteen verses of Echad Mi Yodea, the Passover table song, you will ever see and hear. The 1500 seats were virtually sold out although you can walk in just before the show and pick up a ticket. The show continues tonight and tomorrow night at the same place before, finally, moving on to Plymouth on Friday and Saturday. Try to see it before it leaves these shores. Typically, The Guardian newspaper, who are quite happy to promote racist cultural boycotts against Israel that also demean apartheid, linked their report Batsheva Dance Company braces for Gaza protests in London straight through to the Facebook page of Don’t Dance With Israeli Apartheid. 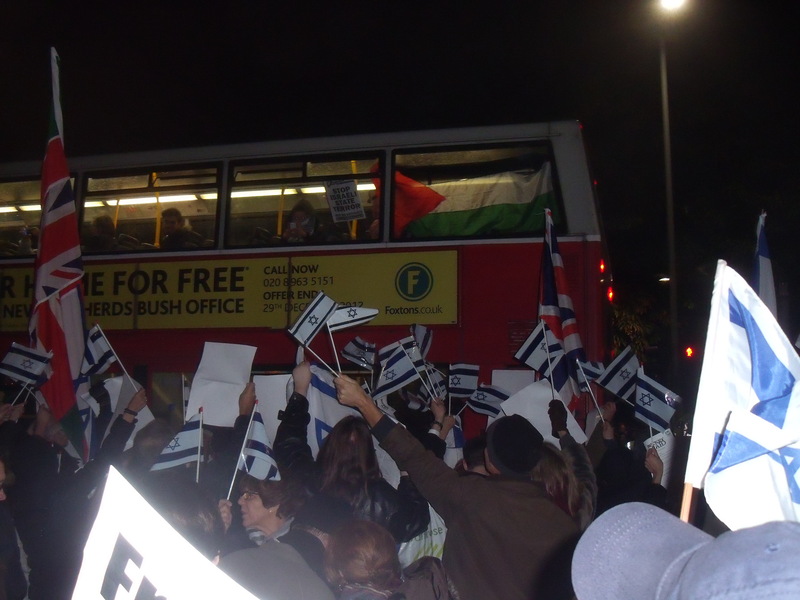 Photos and footage from last night’s anti-Israel and pro-Israel demonstrations in London. 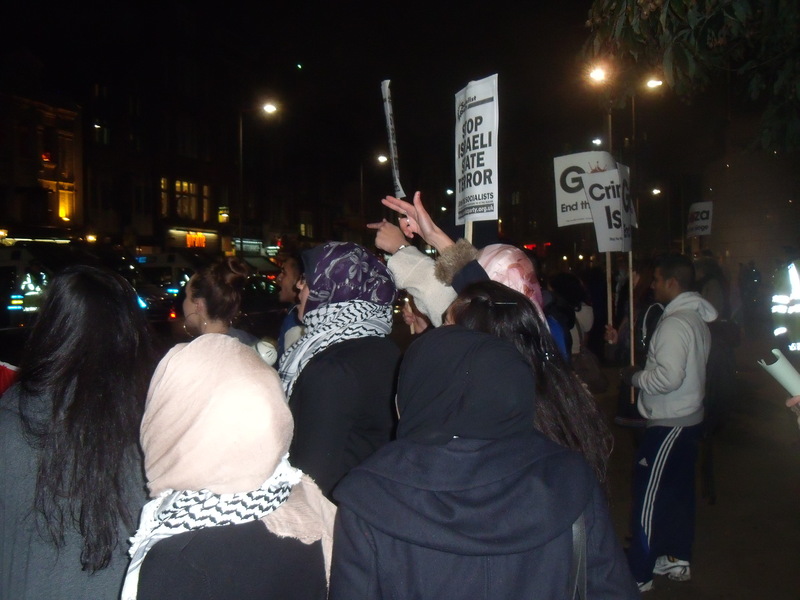 Supporting Israel outside the Israeli Embassy last night. The words aren’t about settlements, Jerusalem or, even, the Palestinians, but simply call for the total destruction of the Jewish state. 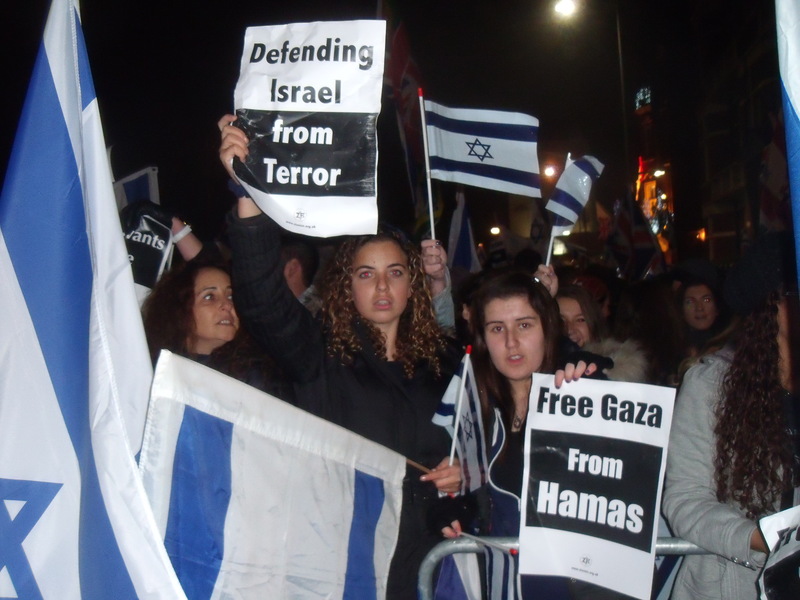 Meanwhile, 400 Israel supporters, mobilised by the Zionist Federation and the British Israel Coalition, called for peace and sang “Long Live Israel”, “Am Yisrael Chai” and the British and Israeli national anthems. Wishing you a Shabbat shalom and/or a peaceful weekend, especially for the people of Israel and Gaza (excluding Hamas). 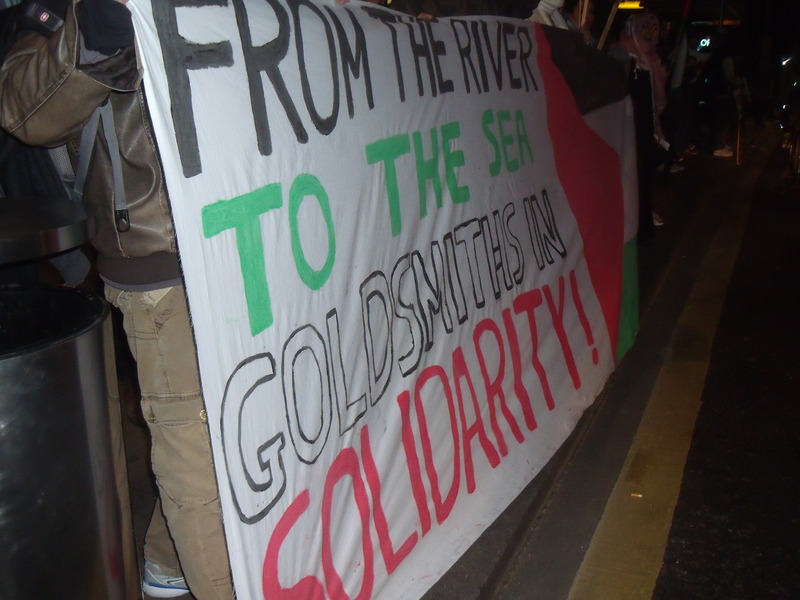 Goldsmiths must be proud of you wanting to destroy Israel. It’s getting late as both sides begin to flag. Taunting the pro-Israelis from across the road. 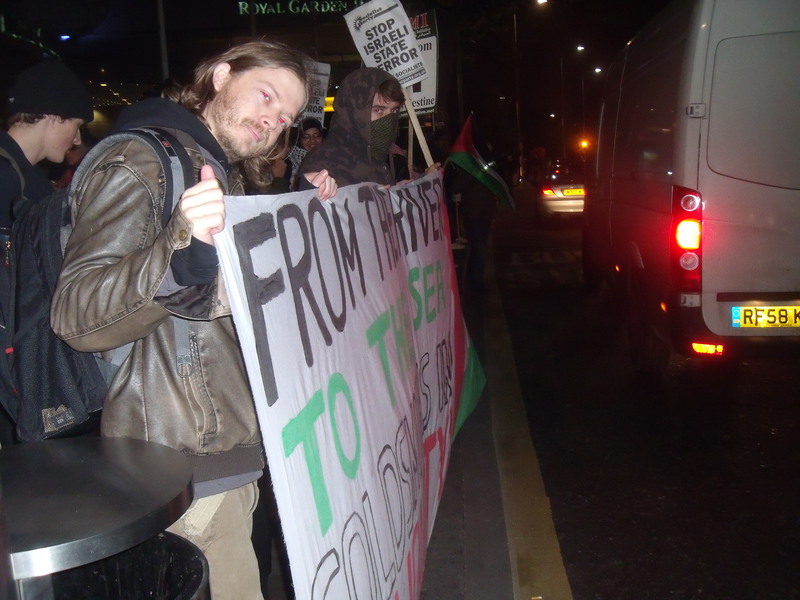 Palestine Solidarity Campaign presents the case for a cultural and academic boycott of Israel. View from the back last night. The once hero of the Palestine Solidarity Campaign Norman Finkelstein recently declared the BDS (Boycott, Divestment, Sanctions) movement against Israel “a cult” and its activists dishonest about their real motive which is the destruction of Israel, not solidarity with the Palestinians. 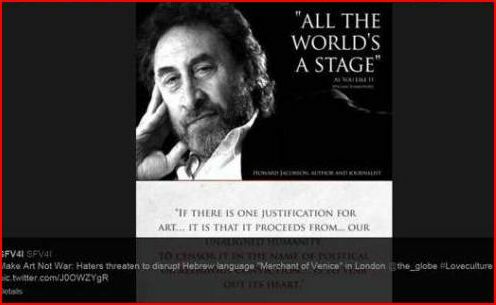 Last night PSC cultists came to the University of London Union with the platform being given to Rafeef “the poet” Ziadah, Ben “I can understand why some people are anti-Semitic” White, Mike “I’m only Jewish because my mother is” Cushman and, finally, Ronnie “I’m a privileged Jew” Barkan. Their aim was to brainwash, I mean persuade students to boycott Israel. Ziadah started by claiming that “Israel has oppressed the Palestinians for decades” and has “denied them their fundamental rights of freedom, equality and self-determination” and that eventhough there were “drawers of UN resolutions saying Israel is wrong”, still nothing has happened. She took offence that the Dome of the Rock, a Palestinian icon, appeared in Israeli travel brochures and that hummus and falafel had been appropriated by Israelis for their national dish. Last night Ziadah painstakingly detailed the PACBI guidelines for boycotting Israel, including any event that promotes “balance” between Israelis and Palestinians, even if it should “encourage dialogue”. Although, seeing as Ziadah said that all Israeli institutions are complicit , unless proved otherwise, the guidelines do seem rather surplus to requirements. But here was her deal for Israeli artists: Should they announce that they agree to the BDS requirements of ending the occupation, ending discrimination of Arabs in Israel and allowing the return of some five million so-called Palestinian refugees to Israel then such Israeli artists won’t be boycotted. During the Q&A a student asked how to defend the accusation that the call for BDS was comparable to the Nazis’ treatment of Jews. Cushman said their was a huge difference between peaceful protest and Stormtroopers standing outside a shop. Next up was the Israeli Ronnie Barkan who heads up Boycott From Within. Yes, that’s right, such an, apparently, “oppressive state” as Israel actually allows such an organisation to operate in Israel. Barkan described himself as a “privileged Jew” and viewed Israel as an “ethnic supremacist state”, which had ethnically cleansed and ethnically segregated the Palestinians. In fact segregation, according to Barkan, was so complete that Arabs are unlikely to be spotted in Tel Aviv. He said you wouldn’t find an Arab living there as they are confined to Jaffa. I’m sure my Israeli friends will tell me this is far from the truth. Ben White also demanded an academic boycott of Israel. He said that “Israeli institutions are in bed with state organisations of oppression”. He condemned Tel Aviv University, Bar Ilan University, Ben Gurion University and even Haifa University for its National Security Studies Centre which has “trained hundreds of senior offices in the IDF that then go onto commit war crimes”. There were some good pro-Israel questions asked during the Q&A, but it would have been good to have seen audience members leafleted with balancing literature on their way out of the venue (ZF, BICOM, CFI etc. where are you at times likes this?). Apart from the woman next to me accusing me of being a “Zionist spy” and claiming that I “want to exterminate all Palestinians”, it really wasn’t as bad as some of the PSC events I have been to. Although, that’s not really saying much. 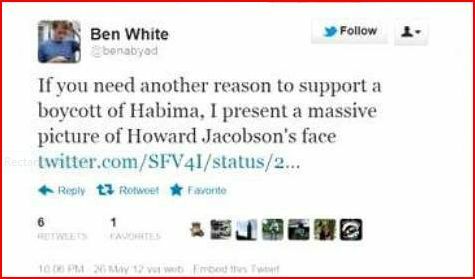 In my opinion, for an elected politician to promote Ben White, considering White’s views, is highly offensive. The Warped Mirror neatly recounts what happened. So Bar Hillel abhors racism, but is “prejudiced against Jews”. Work that one out. 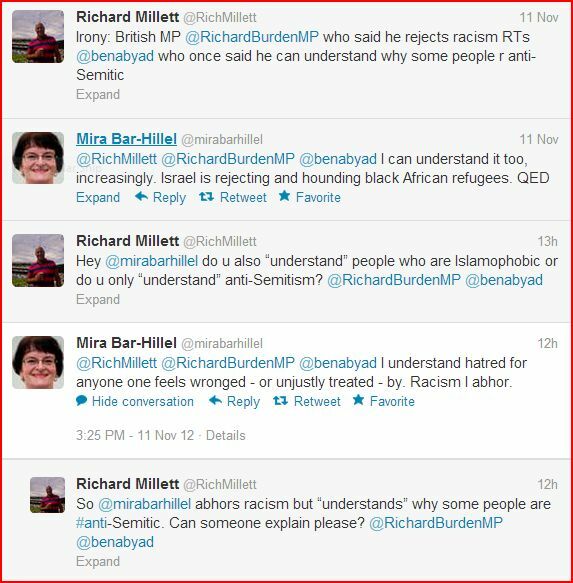 It is very concerning that a British MP, who does denounce anti-Semitism, still goes on to promote someone like White with such views and doesn’t see anything wrong in that. Or maybe, as Burden suggested, I should just “grow up”. In rhyme, in sorrow and in a single word, readers took my challenge. Which one gets the bottle of wine? Technically, that may be true, as the small Jewish communities of Karachi and Peshawar dispersed decades ago. But it is interesting that he felt the need to create a distinction between a hatred of Israel and the shunning of Jews. There is anti-Jewish rhetoric in the local media in Pakistan. Many would argue that in a nation without a history of local anti-Semitism, this is actually a manifestation of anti-Western sentiments, along with the country’s intense hostility with neighboring India, which is increasingly becoming a strategic ally of Israel. It doesn’t seem as though Pakistan has a homegrown tradition of Jew-hatred. On Wednesday, a British woman of Pakistani origin, Shasta Khan, was charged in a Manchester court for planning, along with her husband Mohammed Sajid, what could have been the worst anti-Semitic attack on British soil in living memory. Born and raised in the Manchester region, she would have seen and recognized Jews from the large Orthodox community in the city. The couple is alleged to have scouted out targets in the Prestwich neighborhood, where thousands of Jews live and work. A different duo of young British-Pakistanis, Asif Mohammed Hanif and Omar Khan Sharif, became radicalized after traveling to study in Damascus, where they were recruited by Hamas and carried out a suicide attack at a Tel-Aviv pub, killing three people, in 2003. In contrast, Khan and Sajid are accused of embarking on their Jihad after surfing radical websites. They allegedly learned how to build homemade bombs from Al-Qaida’s Inspire magazine, and instead of travelling to the Middle East to strike at the Zionist enemy, they decided to avenge the Palestinians by murdering fellow Britons, members of a neighboring religious community. But that is how anti-Semitism has evolved: Defying reason and ideology, overcoming geographic and social divides, it adapts to new environments and conditions. Anti-Semitism is the most flexible and versatile of hatreds. That is my main conclusion from the many answers I received over the last two weeks, following the question I posed to readers: “Why are some people prejudiced against Jews?” But that was not the only conclusion. A brief reminder: I decided to open up the column to readers following the hysterical reactions of some politicians and community leaders in Britain when this question was posed to high school students in a national exam. Financial blogger Henry Blodget was inundated with angry responses when he asked the same question with sincerity and seriousness. I had hoped that this column’s readers would prove both more intelligent and display a greater sense of equipoise than those who expressed outrage over the exam question. The reader responses exceeded my expectations. I know that some would label Mira with the despicable title of “self-hating Jew,” and while I don’t necessarily agree with all she writes, I think she expresses genuine concerns and should be heard. Mira’s answer is one of my two honorable mentions. The other honorable mention goes to Richard Asbeck, who managed in verse to convey the uneasy feeling of many Jews and non-Jews at the separateness, perhaps aloofness, that Jews have conveyed over the millennia. Although I allowed up to 100 words, some readers made do with just one or two words: Envy; jealousy; religion; Zionism; ignorance; Jesus Christ. All are indeed reasons why people are prejudiced against Jews, and there are of course many more, often conflicting, and never justified reasons. And that is why I said that anti-Semitism is the most flexible of hatreds and why I chose Mark Gardner’s entry as the winner. My only hesitation is that the writer is a professional in the field, who serves as director of communications of the Community Security Trust (CST ), of British Jewry. My choice of Mark as winner is not an endorsement of the CST; indeed I criticized the organization in a column on an unrelated matter two months ago. 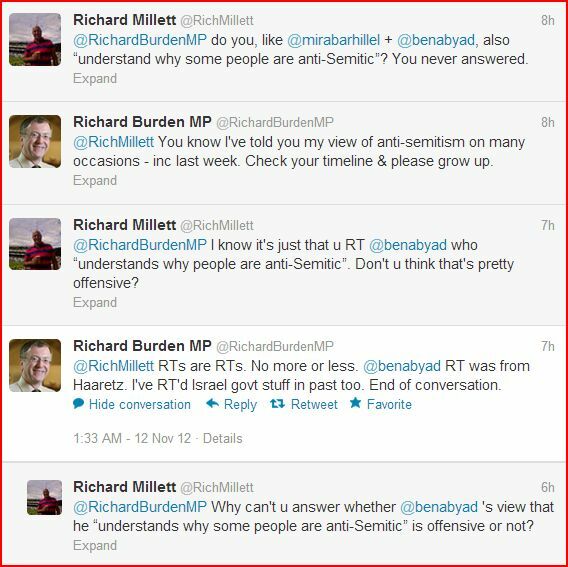 But unlike others who monitor anti-Semitism, I think that his entry proves he can address the issue in a balanced manner. So he gets the (kosher ) bottle of wine.